Bead Bazaar is hosting a discussion during Bellingham’s Steampunk Festival! Come join us from 2:30-3:20pm at the Fairhaven Village Inn conference room to view fun jewelry samples and learn new ways to incorporate Victorian elements in Steampunk Design. Since Steampunk is mainly a Neo-Victorian movement, or a reimagining of the Victorian era, we’ll be examining a few Victorian jewelry trends and how the elements of Victorian jewelry design can be applied to your cosplay and character. As with many other Victorian social conventions, Queen Victoria was a strong influence in jewelry of the time. 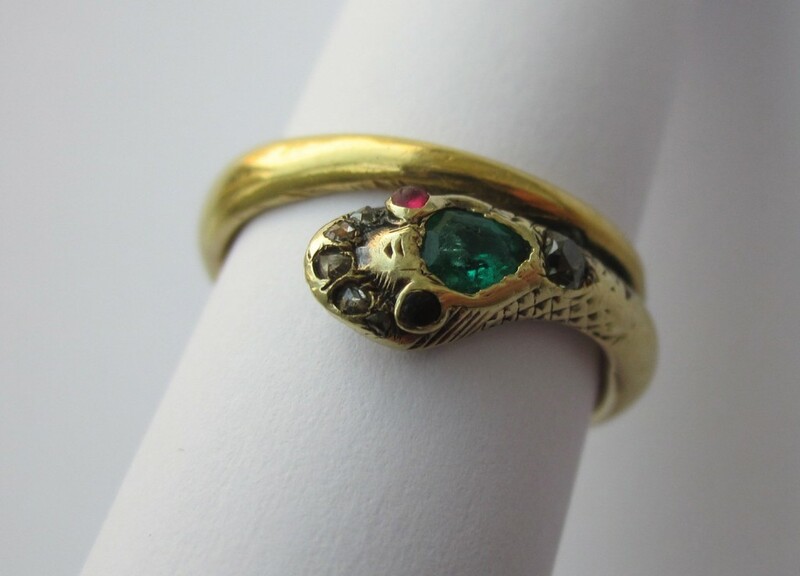 When she became engaged to Prince Albert he proposed with a ring shaped like a snake, with emeralds set in its head. This ring reveals the strong sense of sentimentality that would dominate Victorian jewelry styles. 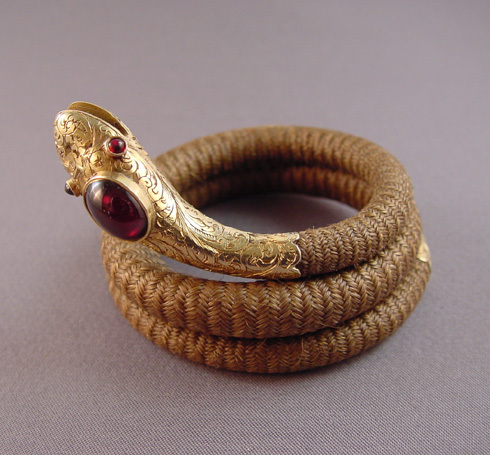 The snake symbolized eternity, and was thus a popular motif in jewelry of the time; making an engagement ring with a snake made it a symbol of eternal love. Emeralds were Queen Victoria’s birthstone, making them another sentimental design choice. We were unable to find any photos of this engagement ring, but below is a Victorian era knock-off, which reveals how influential Queen Victoria was. This would be the first of many trends she set. 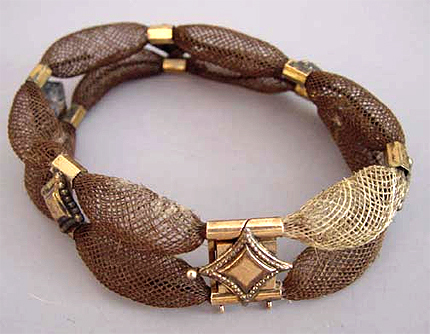 The Victorian sense of sentimentality was also expressed by the craft of hair jewelry. Hair was intricately wound, woven, or braided into delicate cords or set into lockets and pendants. 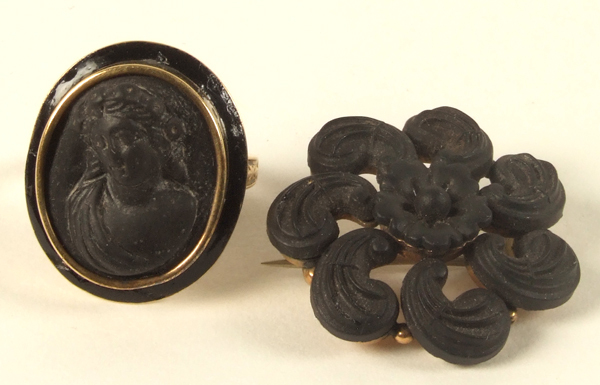 These became tokens that reminded the wearer of their loved ones. 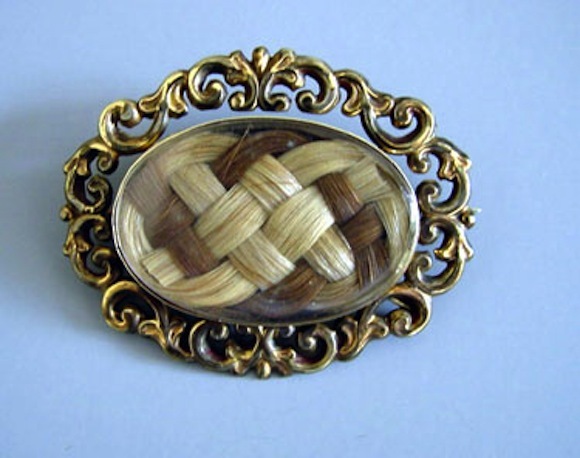 Sometimes the hair came from multiple family members, as can be seen in the brooch below. 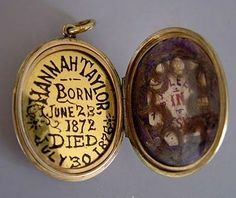 Hair was also used as a memento in mourning jewelry, one last piece of a lost loved one. After the death of Prince Albert in 1861, Queen Victoria set the social standard for mourning. Jet, also known as black amber, was her stone of choice, and the greater population didn’t hesitate to embrace her mourning style. 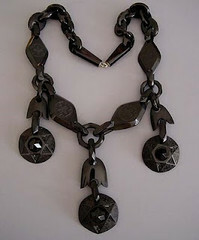 Jet jewelry became more and more popular for its flat black appearance. Queen Victoria remained in mourning until the end of her life, another sign of Victorian sentimentality. Part of what made Queen Victoria a major fashion icon was the social atmosphere of the time. With an increasingly growing middle class, many women started modeling their attire and accessories after the super-rich. This visually set them apart from the lower-class. However, they didn’t have the budget for expensive diamonds, gold, or rare jet, so the market for gemstone alternatives and black enamel grew. Machine made goods also reduced costs, so a woman could now look wealthier with a meager income. This desire to emulate the upper classes helped make the chatelaine a popular accessory. 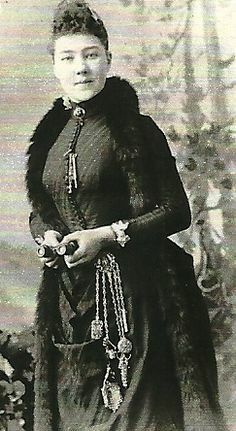 A chatelaine was the equivalent of the Victorian woman’s Swiss Army knife; a select set of tools was kept at her immediate disposal by hanging them from a decorative brooch pinned at the waist. 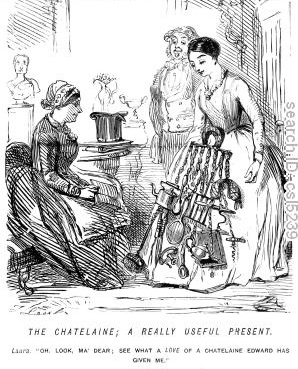 The chatelaine was originally a housekeepers tool, used to keep her keys at hand. It was held by the woman who directed servants and had access to all parts of the house, making the chatelaine a status symbol. It also was used as a form of watch chain by the upper classes, and as we’ve already seen both then and today, once something is done by the wealthy, the rest follow suit. So what does this all mean for your Steampunk character and costume? Plenty! You can use your jewelry to tell a story about your character. – Is your character in mourning? – Is your character lower-middle class, aspiring to appear upper class? – Does your character have need for immediate access to certain tools? – Is your character sentimental or in love? – Is your character fashionable, following trends set by the monarchy? – Or does your character set their own rules, and thus break what would be considered Victorian social norms? This article only scratches the surface of what is possible when you incorporate Victorian elements in Steampunk design. All you rule-breakers may want to look into the Arts & Crafts and Aesthetic Dress movements- the first was a backlash against mass-produced goods, while the second sought to give women more freedom and practicality in their attire. We’d be willing to bet there’s a least a few Steampunks who can appreciate these sentiments. In the mean time, dig in to some history and have fun discovering the world of Victorian Jewelry!